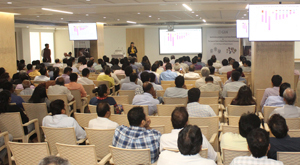 GIA India conducted educational seminars about "Identification and Update on Laboratory-Grown Diamonds" and "The Causes of Colour in Natural Fancy-Coloured Diamonds" on Jan. 24, at Bharat Diamond Bourse Convention Hall in Mumbai. The seminars were presented by Dr. Sally Magaña, GIA senior research scientist from Carlsbad, California. Dr. Magaña is an expert in diamond physics, treatments and laboratory-grown diamonds. She has authored and co-authored numerous research articles about laboratory-grown diamonds, temperature effects on luminescence centres in natural type IIb diamonds and more. More than 200 participants gained in-depth knowledge on HPHT and CVD laboratory-grown diamonds, their distinguishing characteristics and identification and detection methods. Participants also learned about GIA's extensive research on diamond colour and received an overview of the colour-causing factors in natural diamonds. Speaking about the seminars, Mr. Mehul Shah, Vice-President, Bharat Diamond Bourse, said, "These educational seminars are very much the need of the hour. The industry is going through a lot of changes and there is a need for awareness. Such initiatives at the Bharat Diamond Bourse are always welcome. I would like for GIA India to conduct more seminars like these as the knowledge will bring a lot of transparency and help the industry grow." "GIA has been on the cutting edge of gemmological research for decades. As new gem materials and treatments emerge, our research efforts have consistently helped us give the trade the assurance of accurate and reliable reports with full disclosures," said Ms. Nirupa Bhatt, Managing Director of GIA India and Middle East. "I want to thank Dr. Magaña for sharing the latest on laboratory-grown and fancy-coloured diamonds with members of the trade. I am sure the participants will benefit from this seminar and become more confident in buying and selling."